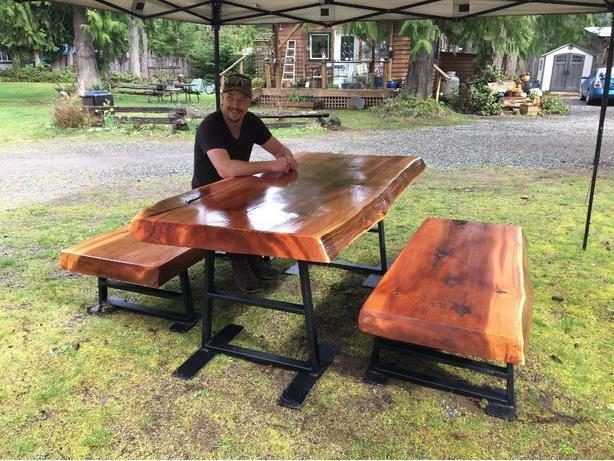 Live Edge Old Growth Red Cedar Picnic Table with Black Iron. The wood was milled with a chainsaw, and the steel was fabricated, all by Jonah. After sanding I finished it with 4 coats of a clear finish satin oil based varathane. The 600 year old tree that this table is made from was dead standing on a piece of property. The owners cut it down and were just going to burn the wood. We bought the logs at current market value and Jonah uses nothing other than his long bar on his chainsaw to cut the log into usable slabs. We are in the Parksville area at the moment but can arrange delivery or to meet anywhere on the island. $2,500 is what we are asking for but If you are a business or are looking to use commercially a deal could be made for a trade of advertising our products.